Photos circulating on social media show one New Hampshire who appears to be in blackface and another with a Confederate flag. One of the students, a senior at Pinkerton Academy in Derry, tells necn this is all a misunderstanding. He says he painted his face black for a school spirit event, and now people are calling him racist. "It was meant to be all black to support your school, and that's exactly what I did," said Tim Coulon. "It wasn't meant to be racist." The picture, in which he is wearing black face paint, is being spread all over social media, drawing criticism from strangers and friends. "It all kind of blew up overnight," he said. Coulon says he was dressed up in all black for Pinkerton's Blackout Day during School Spirit Week, and he decided to paint his face to match his clothes — it didn't take long before he realized it was a bad idea. "I was walking to class and I got some looks and I washed it all off — I washed it off right after the period," he said. Coulon showed another controversial photo from spirit week in which a student was wearing a confederate flag. 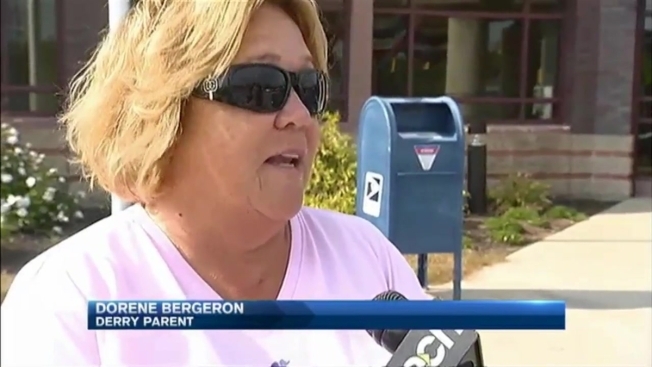 "In the day and age we're in, I think it is concerning," said Derry parent Dorene Bergeron. "Things like that I think can escalate." Derry Police learned of the photos through Facebook. Captain Vern Thomas says his department is not involved. "It would appear there is no real issue with respect to racism," he said. "If there was, we would be involved." Pinkerton Headmaster Griffin Morse issued a statement saying, in part, "Students who make inappropriate, degrading, and/or inflammatory slurs will be subject to immediate suspension. That is our policy and we will continue our investigation of the incident." Coulon says he's well aware that — that racial tension is one of the most serious problems facing our nation, aand he never intended to be at the center of it. The headmaster says the two students involved have been spoken to, but there's no word yet on whether or not they'll be punished.